100 Pack of brass plated Infinity hangers with #8212 3/8 x 4 brass plated pan head screws included. Infinity hangers are used as either turn buttons or the most popular use is as a replacement for screw eyes on narrow mouldings. Screwed into the moulding through one hole then use wire from one hanger to the other. 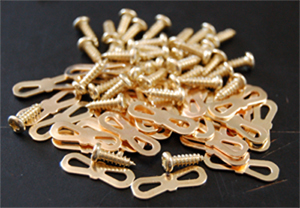 Low profile alternative to screw eyes.Stronger and better than screw eyes.